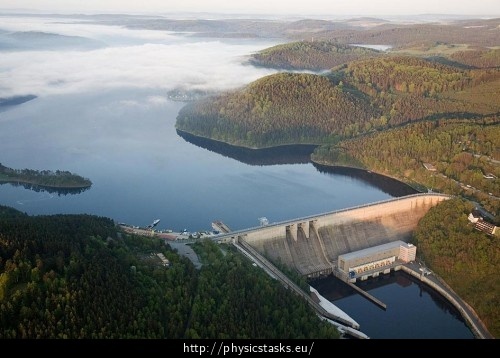 Orlik Dam is the largest dam in the Czech Republic conserning the capacity of water which the dam contains. The heel of the dam is 275 meters above the sea level, maximum allowed height of the water level is 354 meters above the sea level. The area of the dam is approximetly 2730 ha. a) During the flood in 2002 the maximum allowed height of water level was exceeded by 2 meters. Figure out what pressure was in the water near the heel of the dam. 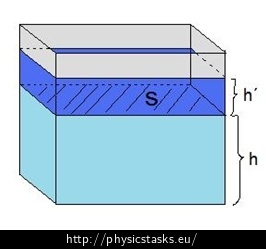 What is the resultant pressure at the bottom of the dam? What else affects the pressure? Atmostpheric pressure is caused by the gravitation of air column above the surface of the dam, hydrostatic pressure caused by the gravitation of water column above the bottom of the dam. What values does the atmospheric pressure approximetly reach? For our calculation, we get by with the approximative value of 100 000 Pa.
How can we figure out the hydrostatic pressure? What was the maximal depth of the water by the dam during the floods? where h is the depth of the water, ρ the density of the liquid and g = 10 N/kg (number we have to multiply the mass with to get the gravitational force). Substitute into the formula (1) from formulas (2) and (3) and figure out the pressure p.
What is the gain in the volume of the water in the dam when water level rose about 1 meter? The pressure in the water near the heel of the dam was approximately 910 kPa. The water level would rise 1 meter in approximetly 5.8 hours based on the given inflow and outflow. The water level would rise 1 m in approximately 5.8 hours based on the given inflow and outflow.